Each year Redlands Bowl Performing Arts depends on a large team of over 1,000 dedicated community volunteers to help support the Summer Music Festival programs at the Bowl. We encourage you to lend your time and talent, and be a part of the Bowl experience. 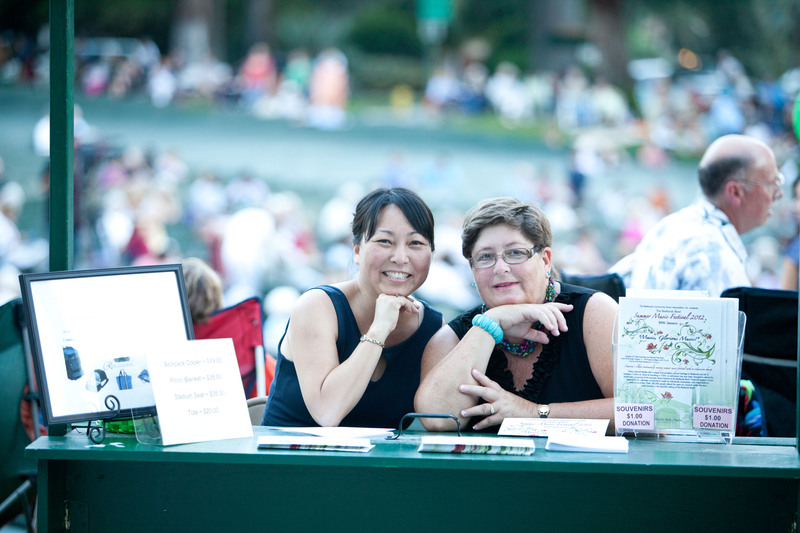 If you would like more information about volunteering, please contact us at: (909) 793-7316 or email: info@redlandsbowl.org. Founded in 1950, the Associates of the Redlands Bowl is a distinct organization of dedicated “superwomen” whose purpose is to raise funds for the Redlands Bowl Summer Music Festival and Young Artist Competition. They accomplish this through a variety of fund raising activities that have been described as “the best parties in town.” These events include the Benefit Gala for the Redlands Bowl and the Associates Tea. The Associates also run the information booths at the Festival and help with the Children’s Music Workshops. Members of the Associates of the Redlands Bowl at one of the information booths at the Redlands Bowl. The newest volunteer group supporting the Redlands Bowl Summer Music Festival is the Hospitality Ensemble. 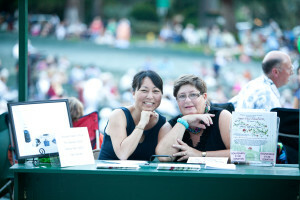 Founded in 2004, this group of friendly hostesses makes sure that the artists who perform at the Bowl have fresh, ice-cold lemonade, a light meal before a performance, or a sumptuous post-performance reception. This hometown touch distinguishes the Redlands Bowl from other venues, and leaves a lasting impression on the performers. The Ensemble members also provide light refreshments for the Young Artists Auditions, distribute the season brochures throughout the community, and usher one evening during the season. The Red Shirt Ushers manage the ushering process for the community volunteers who collect the freewill offering from the audiences. They brief the volunteers, assign their positions, and provide them with the red bowls for the offering. 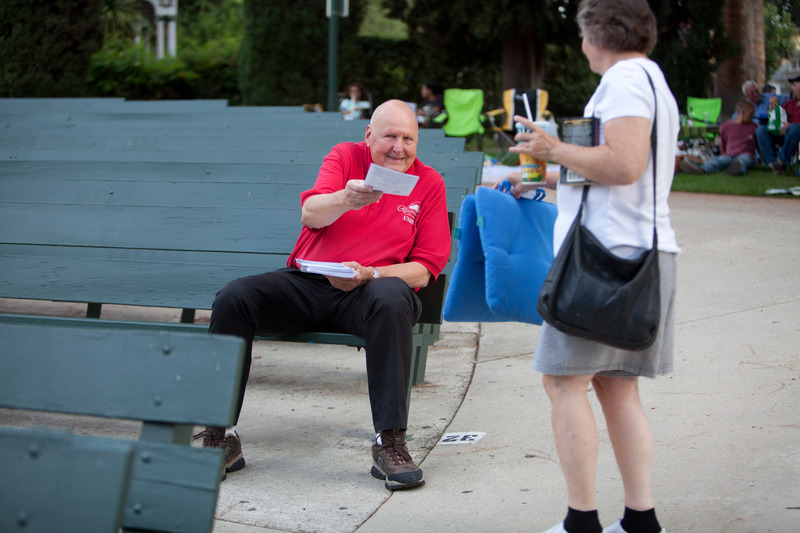 In addition to gathering the red bowls from the evening’s volunteer ushers and counting the money, the Red Shirts provide guests with directions, keep the aisles clear, and assist in seating on crowded performance nights. They are the first point of contact for audience members needing assistance. A Red Shirt Usher hands a Bowl patron a program for one of the evening concerts. Community Ushers The Bowl’s community ushers provide a vitally important service to the Summer Music Festival. These volunteer groups collect the freewill donations from the audience during the intermission break. Civic organizations, service clubs, businesses, church groups and hobby clubs all find that ushering is an ideal way to support the Bowl and have fun at the same time! Many groups arrange to have a picnic together and enjoy the camaraderie of friends, family and co-workers prior to the performance. A special thank you to our 2018 Usher Groups!